In a recent Washington Post blog post… Eskew took the reproductive rights movement to task, and not a minute too soon by his watch. In his column, he explains that advocates for reproductive health are mired in “convoluted, poll-tested messaging” and “cannot win the debate as it is currently framed.” He probably imagines he’s doing us a favor, but he instead seems to be just tuning in to a conversation that’s literally happening all around him. 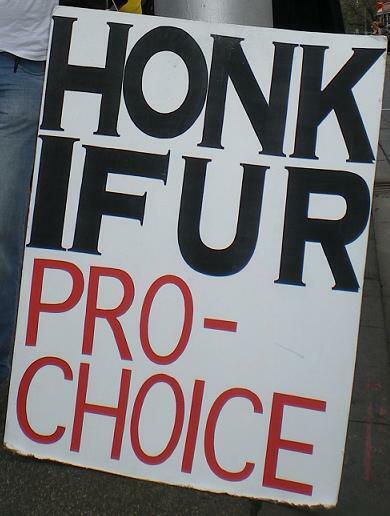 Janet Harris says… people who support abortion rights need new language for expressing their advocacy. She couldn’t be more right, but from a pro-choice perspective, the current political dialogue is even worse than she documents. For years, the pro-choice movement has been on the defensive, using more and more convoluted, poll-tested messaging to try to stand its ground…. The pro-choice side cannot win the debate as it is currently framed; it can achieve only small victories when the other side overreaches…. The reason pro-choice advocates can’t and won’t win is because they don’t have an affirmative argument, only a defensive one…. The problem is “choice” will never trump “life.” Choice is valuable, but life is precious. As long as there is no competing affirmative value for abortion, then life will always win. Lately, there have been murmurings of new language presaging a new movement to affirm the true value of abortion…. But it remains abstract. Eskew obviously still likes “pro-choice” – note how often he used it in his piece. The reproductive justice movement… deserves the lion’s share of credit for articulating the weakness of the choice frame. Admittedly Planned Parenthood Action Fund was later to this party, and interestingly we worked with Eskew’s firm to help us name this in our own work. In fact, Planned Parenthood has hired Glover Park Group, a “public relations, advertising, opinion research, and lobbying” firm, according to Wikipedia, for each of the last six years to lobby and strategize, for a total of $710,000. So Eskew’s post is inexplicable, unless he’s on a hari-kari mission. Or perhaps Eskew just decided to be honest. Planned Parenthood’s decision to publicly dump “pro-choice” from its lexicon has resulted in chaos, particularly among groups like NARAL Pro-Choice America that boast the shunned term in their names. Or perhaps Eskew is trying to back away from the race-relations nightmare Planned Parenthood launched within the movement by initially taking credit for the phrase, “reproductive justice,” which it is trialing as the new, cumbersome stand-in for the dreaded A-word. As Women of Color quickly reminded Planned Parenthood, they coined that term decades ago. Whatever, suffice it to say we can expect Planned Parenthood to abort Glover Park Group. And the very public infighting between pro-abortion groups continues, much to pro-life delight.